One or more photo(s) has been virtually staged. This 3 Bed/2 Bath + Den "Brandon Beauty has it all! 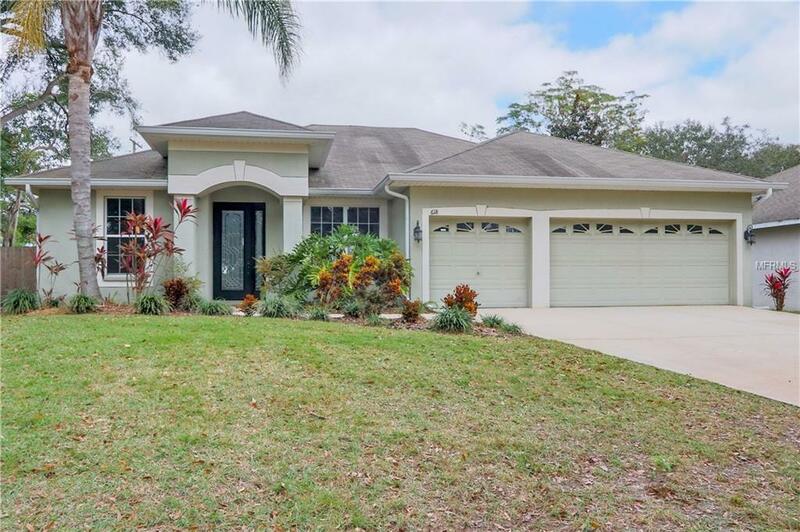 From the CURB APPEAL and PLUSH TROPICAL LANDSCAPING to the open-style KITCHEN, 3-CAR GARAGE and spacious MASTER BATH EN SUITE, this home has everything and more! Located in highly desirable Lakewood Ridge Estates, this home is on a quiet end CUL-DE-SAC on 1/4 ACRES! Step inside and you are greeted with VAULTED CEILINGS and CROWN MOLDING, beautiful SLATE FLOORS throughout living area and BAMBOO hardwood in the dining room/office/den. Beautifully UPGRADED kitchen features designer GRANITE countertops, 42 wood cabinets and STAINLESS STEEL appliances. This home has a desirable SPLIT FLOORPLAN which offers privacy for all with the Master Suite separate from the other bedrooms. The master bedroom suite features DUAL VANITY SINKS, huge WALK-IN CLOSET, travertine tile, large stand-up shower and GARDEN TUB! Step through the family room, youll find a COVERED PATIO with decorative PAVERS and fully fenced in yard. This BACKYARD OASIS has plenty of ENTERTAINMENT space! NEW CARPET in all bedrooms. Conveniently located in the heart of Brandon and within minutes to I-75, the Crosstown Expressway and the Brandon Town Center. Additional Lease Restrictions All Restrictions To Be Verified By Buyer Or Buyer's Agent With Hoa. Pet Restrictions All Restrictions To Be Verified By Buyer Or Buyer's Agent With Hoa.